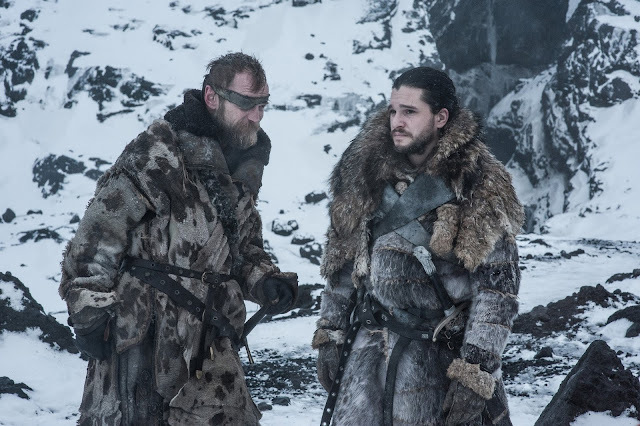 SPOILER WARNING - The following article discusses key plot points in several Game Of Thrones episodes, including the latest: Season Seven: Episode Six - Beyond The Wall. The first time the Game Of Thrones doubts were released was at the end of Season Five. Jon Snow was dead. Originally a fairly minor character - behind at least Robb in the hero stakes - Snow had grown into the series' much-needed hero with 'stickability' and a skill at not getting stabbed. Then he was unceremoniously offed by tricky betrayers, in a death which called to mind countless other unexpected deaths in the series and therefore carried a level of plausibility. The problem was that, as it appeared more likely that Jon could be gone for god, this one hurt and shouldn't have happened. As the season ended and we faced a winter-long wait to find out the true outcome, there was a creeping anxiety. Had the showrunners got this one wrong? Had they made the mistake in thinking that everyone in the show was disposable, instead of merely most of the cast save Jon, Daenerys and, at that point, Tyrion. They hadn't, of course, but the Games Of Thrones anixety had been born. The showmakers could come perilously close to getting things wrong. For all of the key character deaths we had come to expect, at what point was one going to arrive that tipped the balance of the show over from 'bloodthirsty' to 'bloody stupid'? The idea that things could go wrong in this most thrilling and successfully complex of shows was suddenly very real. Beyond The Wall, this week's episode and the penultimate of Season Seven, brought that anxiety back in a new form. Whilst previously the showrunners have excelled in managing a vast number of plots and subplots, characters and motivations, suddenly things were all wrong. There was a very real sense of an ending, and not one that anyone was going to be satisfied with. By the time the camera zoomed in on a dragon's eye about to turn blue, with inevitability as glum as an ice king, we had witnessed Gendry running a marathon distance in three or four shots, where previously forty-odd minutes of episode had been needed. Meanwhile, for our heroes stuck on an ice island, time passed. No-one really seems to know how much exactly. The tension, hardly there to begin with, evaporated like steam off a previously wet and cold, now flaming, sword. The root cause of the situation is that Thrones has a stated aim to finish next year and a lot of threads to cover in the meantime. The showrunners seem to have inherited an anxiety of their own, rushing over events which previously would have merited episode-long examination to squeeze in what currently seems to be the periphery, presumably in order to give everything a neat conclusion. It's just a few episodes ago, last season, that The Battle Of The Bastards gave over most of an episode-long runtime to a single skirmish. Here, the key finale gets barely twenty minutes, as time is given over to Sansa and Arya, apparently being torn asunder by the plotting of Little Finger, not to mention the quest of the band of seven, whose time together spanned just one episode. Meanwhile, back on the ice, the desire to wrap things up neatly results in the aforementioned dragon shot which every man and his dire wolf saw coming. The anxiety then is around what's to come. Thrones continues to be one of the most thrilling shows on television and Beyond The Wall was no exception. But being thrilling doesn't mean you excuse yourself from logic, structure and sound storytelling. Fans can forgive a lot of things, but many will struggle to forgive the show (which started out so complex) ending with a whimper of predictability, haste and slap-dash brashness. There's a rumbling current in the series at the moment about two characters who are related, but who haven't quite worked that out yet. The longer the hints rumble on, the closer we get to having Basil Exposition (possibly in the form of Samwell Tarley and his newly acquired scrolls) pop up and reveal everything in roughly the most unsatisfying manner possible, just so the show can move to its next self-imposed phase of closure. And that's just one of the plot threads Thrones has to wrap up. It's not hard to imagine one or two being closed in a similar way to sending Gendry off on a several hundred mile run. And don't get me started on the second saving of Uncle Benjen.